I Used Personalized Send Times for 15,000 Marketing Emails, and Here Is What I Learned. Instead of choosing one time to send emails to my entire list, I used send time personalization to make sure each email arrived at the right time. Here are the results. Did you know that 39% of email opens happen within one hour of delivery? According to Yesware research, that first hour after sending is crucial to the success of your perfectly-crafted marketing email. Email marketers have known this for years. Traditionally, they have recognized this issue by identifying popular times when their audience opens emails, and sending a big blast at the single most popular time for their list. This is where the endless list of best email send times began. While all of these popular misconceptions compete for your attention, Experian data shows that there is no single best time for sending email! You know what would be a much better predictor of a good email send time? The actual times that your list members have opened email in the past! That way, you do not need to select one arbitrary time to fit the habits of 15,000 people at once. Until recently, there was no good way to send emails at customized times at scale. You could only choose one “best time” for the whole list, and then adjust based on time zone. Over the past two weeks, I tried out a new AI-driven tool called Seventh Sense that sends at the perfect time for every member of your list. It works alongside HubSpot and Marketo to review the engagement history of each contact, and send email at the ideal times for each subscriber. Here is what I found. If you have already been sending email through HubSpot or Marketo, then you are automatically collecting email engagement data. 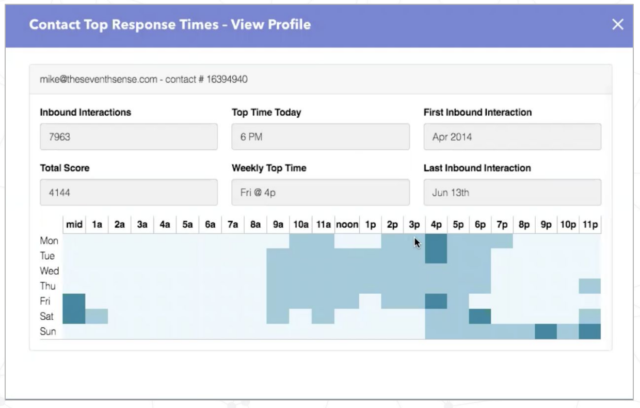 Once you set up the Seventh Sense integration, the service will mine past data and find the most common open and click times for each contact with hourly granularity. First, you set up an email like you normally would in HubSpot. But, once you get to the Recipients tab, select ‘Save for Automation’ at the top instead of choosing a Static or Smart list. You will choose the list in Seventh Sense. Then, you use Workflows to prepare the email to be sent based on a manual trigger. 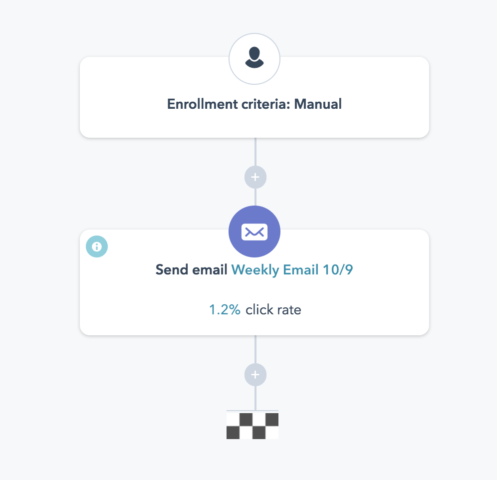 Level of randomization: Seventh Sense will send a certain percentage of emails at randomized times in order to test if there is a better time to reach each contact. You can choose to randomize most of the list if you do not have good data, or you can personalize most send times if you have plenty of individual data. So far, we have only completed 2 weekly campaigns since we initially integrated Seventh Sense 2 weeks ago. And, all of the existing email data in our HubSpot account is still pretty immature since we started using it for email marketing around 6 weeks ago. We had been sending previous email campaigns at multiple times on Thursday and Friday. So, for our first two campaigns with Seventh Sense, I set the time window for Thursday-Sunday because we have the most complete data for email preferences on Thursday and Friday. The turquoise color represents emails sent at predicted times, in other words, based on past email engagement. The dark blue color represents randomized times that Seventh Sense uses to sample for the best time for each contact. In this round of emails, only about 40% of emails were sent at predicted times! The other 60% were sent at randomized times because we still have a minimal amount of data on each contact after 6 weeks of HubSpot email use. 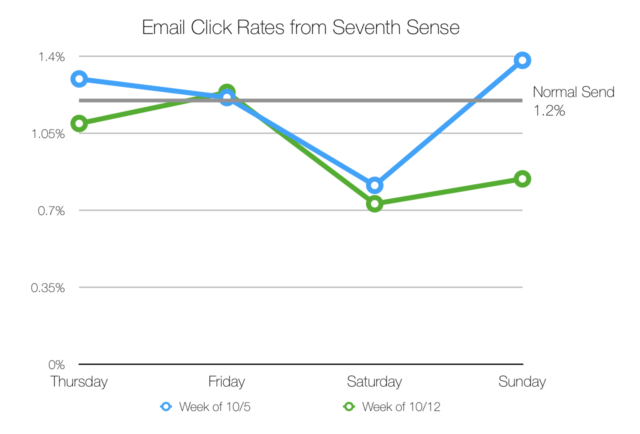 However, in the first campaign from Seventh Sense, 75% of emails were delivered at randomized times. The system automatically uses a higher percentage of personalized send times as you use it more frequently. 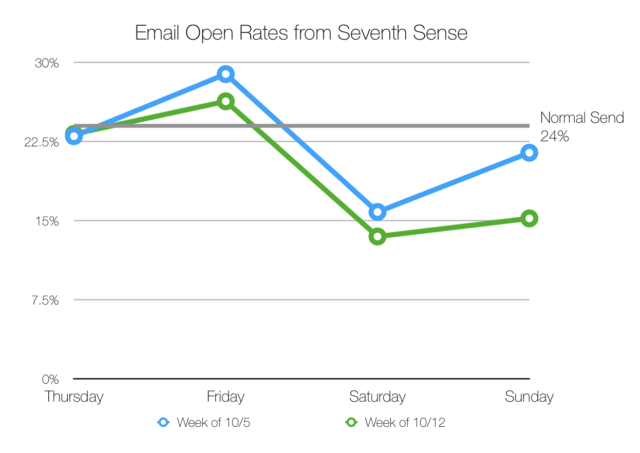 A normal email sent to our entire list will get around a 24% open rate. Thursday and Friday met or exceeded that number, while weekend open rates were much lower. The trend was the same, outside of one outlier point- Sunday on the second campaign. This could have been an issue with a small sample size, however, and is not statistically significant. Seventh Sense shows promising results on Thursday and Friday with minimal extra effort on my part. But, I made the mistake of limiting my sending window to 4 days. I didn’t give myself a chance to reach all of the people who have their best email engagement times on Monday-Wednesday. And, some of the subscribers that open and click on the weekends actually received the email during the week! If you check out the graph in the section above that shows randomized and predicted emails by day, you can see that most of the emails during the weekdays are predicted, while most emails on weekends are randomized. By choosing only 4 days, I squished all the randomized times into a weekend window as opposed to letting a large percentage happen during the normal work week. If I want to use the Seventh Sense sampling algorithm to its full potential, I need to be sending all 7 days of the week. I chose the Thursday-Sunday timeframe in the first place because I was unsure which day I would send out our mass email the following week. Instead, I should have standardized Thursday as the universal start of the campaign so I could use all 7 days of the week. This is especially important because our database only has 6 emails of data. So, in the future, I will use a Thursday-Wednesday timeframe for all mass emails. 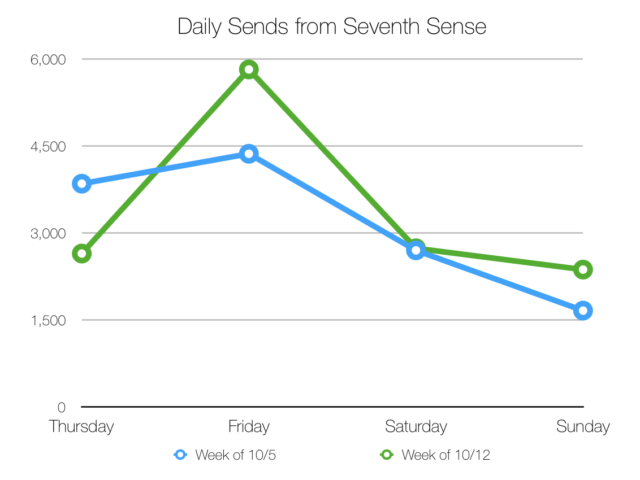 That way, Seventh Sense can sample every day of the week to discover the best send time for each contact. Any randomization will be much more likely to result in opens and clicks from my list. I plan on writing a follow-up post in 6-8 weeks after trying these changes. I expect to see a 10-20% boost in email engagement, which should only improve as I send more frequently! 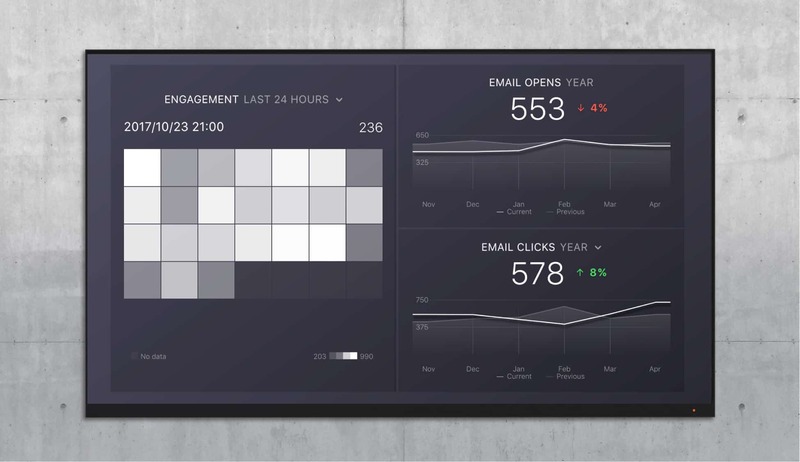 And, I will be using our Seventh Sense Engagement dashboard, since I will have a more developed picture of our email marketing data. Interested in trying Seventh Sense? Sign up here for a demo.